With 800 episodes over the course of 22 years, the Power Rangers television show is arguably the single most successful live-action superhero franchise of all time, and certainly one of the strangest. Adapted from Japan’s long-running Super Sentai series, created by manga legend Shotaro Ishinomori, the Power Rangers combined the giant robots and monsters of their Japanese counterpart with a completely different set of secret identities and problems, and became a pop cultural phenomenon. That’s why we’re looking back with an in-depth guide to Mighty Morphin Power Rangers, including its source material, Kyuoryu Sentai Zyuranger, in ComicsAlliance’s Ranger Station! This week, we’re taking a break from the main timeline to learn the Green Ranger Kata! So here’s the thing that can never really be overstated about Mighty Morphin Power Rangers: In that first year, it was quite literally the most popular thing in America — at least in terms of what the kids were into. That’s a title that it inherited from Teenage Mutant Ninja Turtles, and would eventually lose to Pokémon, two other franchises that managed to survive their initial fad of popularity and carve out decades of success, but in 1994, the Power Rangers were ruling children’s media with an iron fist. That probably shouldn’t have been a surprise, though. By the time we got to Mighty Morphin here in America, the series had been running in Japan as a cornerstone of children’s programming for almost two decades, but the fact that it was translated so weirdly and still reached a level of success that finds it still running 23 years later is pretty remarkable. And it was successful — so successful, in fact, that it couldn’t be contained by television. With kids all over the country clamoring for more Power Rangers, Saban was happy to supply some weird, non-canon ephemera to fill that Zord-shaped hole in our young hearts. There was a live show (which eventually saw a VHS release and is now included on that pricey full-series boxed set as a bonus feature), the Fan Club video that came with Junior Power Ranger shoelaces, and other assorted ephemera, and, of course, the completely insufferable Alpha’s Magical Christmas. 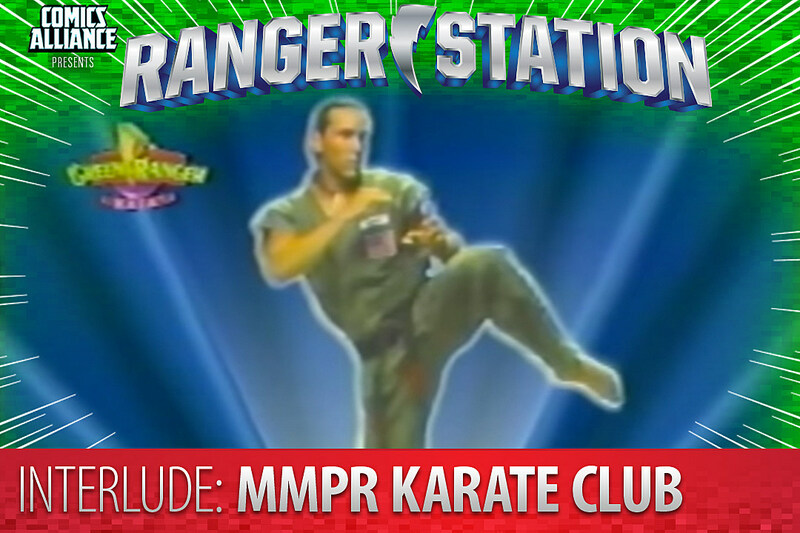 And then there was the Mighty Morphin Power Rangers Karate Club. Power Rangers, like Ninja Turtles before it, played on the natural interest that I think all kids have in martial arts and sparked it into a full-on craze. I know that’s how it was for me, but in my case, the fact that my Saturday morning karate class was scheduled opposite new episodes of Power Rangers on TV meant that I was way more likely to skip out on the real thing in favor of the martial arts action that also involved robot dinosaurs. 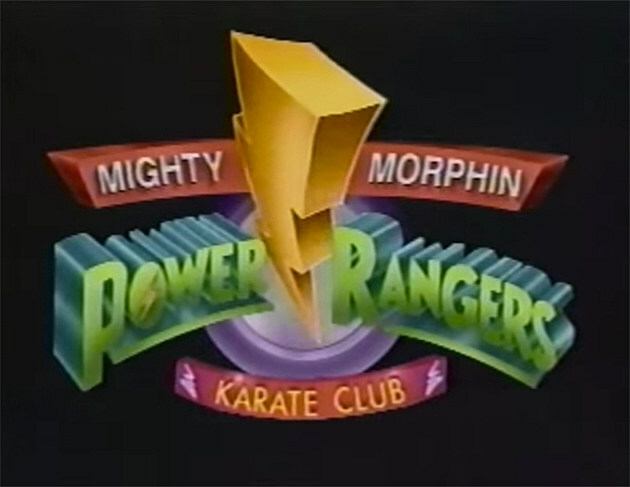 The solution: The Mighty Morphin Power Rangers Karate Club, which brought martial arts instruction into your home through the magic of VHS. Given that it started with a tape subtitled “Level 1,” I’m guessing that it was meant to be a series, but Level 2 never came out. Still, this one’s pretty interesting. 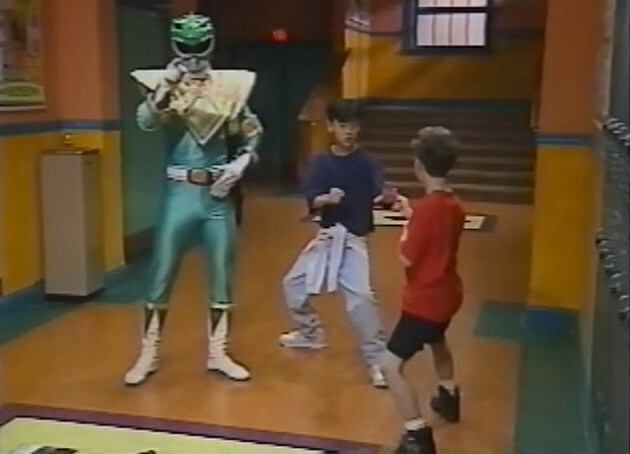 It was released during the second season of Power Rangers in late 1994, but given that it stars Jason David Frank as Tommy and refers to him as the Green Ranger and only uses footage of him as the White Ranger in the opening sequence, it’s pretty safe to assume that it was filmed a little earlier. So for those of you keeping score at home, that’s why we’re covering it between seasons. 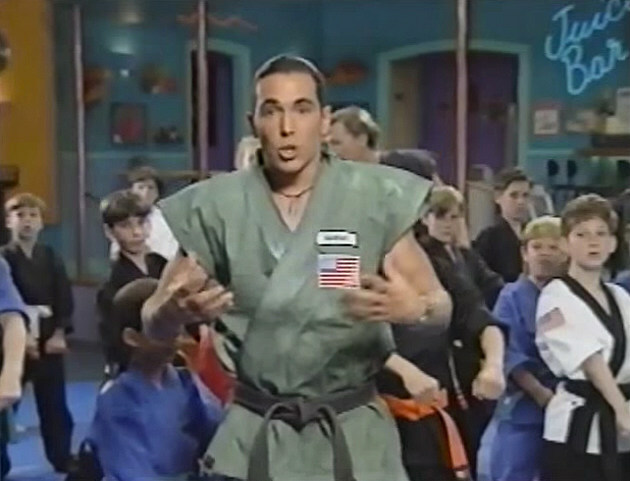 The majority of the video is exactly what you’d expect: JDF showing a class full of kids some pretty basic karate moves and warm-up exercises that are easy to do at home, assuming that you either don’t live in an apartment or don’t mind really annoying your downstairs neighbors by running in place and letting out a loud KIYAAA! Everything that’s taught here is meant to be put together into the Green Ranger Kata, which is short and basic but still pretty impressive when it’s pulled off with JDF’s level of speed and precision. And to be honest, he actually seems like he’s a pretty good teacher. 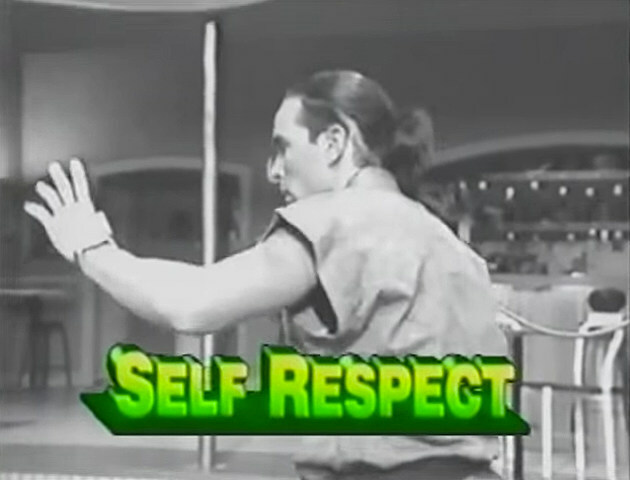 One thing that’s evident watching Power Rangers is that while JDF is not a very good actor (and never really gets above competent in his entire tenure on the show), he is really, really good at martial arts. I’m pretty sure that’s why most of his prominent scenes on the show during his initial run as the Green Ranger were built around yelling and doing jump kicks rather than his ill-fated attempts to emote. Here, when he’s tasked with teaching his moves to a class full of kids in a setting that’s more like a dojo (even though it’s filmed on the Youth Center set with a couple of mats thrown down), he seems a lot more comfortable. The problem is, whenever he has to explain what he’s doing to the camera, the fact that he’s only 20 years old and pretty inexperienced as an actor comes right back. It’s also pretty evident that they filmed everything in one take, but even with that little bit of weirdness, it’s not really all that strange. What makes it weird is everything around the actual teaching. And speaking of Alpha and Tommy, there’s a weird bit at the beginning where Zordon announces that “it’s time to train another group of students in the exciting art of karate.” It’s the “another” that’s really confusing me, because it implies that this happens with regularity, and it’s something that we’re just meant to accept as a logical piece of the show. Complicating matters even more is the fact that Richard Genelle shows up near the beginning as Ernie in a bit where he gives JDF a new kind of juice but doesn’t tell him what’s in it — a bit that goes nowhere — and stays in character the entire time. So Tommy is Jason but Ernie is Ernie, and everything is extremely confusing. 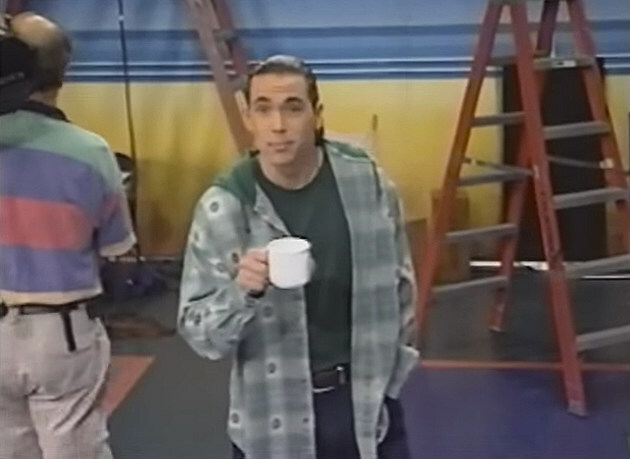 Before he gets to the exercise, JDF appears in an intro sequence where he walks through the set holding a coffee cup that is a) completely empty, b) something he has never once held on the show, and c) clearly just handed to him so that he would have something to do with his hands. Why they didn’t just give him a gym bag with his gi and some equipment, we may never know. 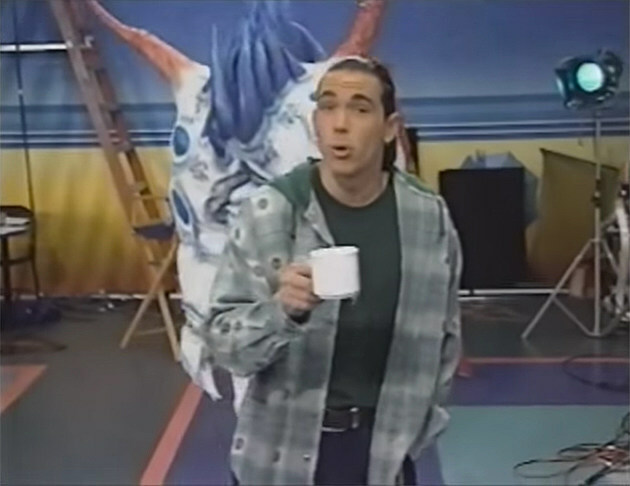 I also hope that Tommy just carries around a coffee cup for the duration of MMPR Season 2, but I feel like that’s probably not going to happen. The video is also broken up with eight core principles that we’re all supposed to learn as part of our beginner martial arts training, and while they’re pretty solid — in case you’re wondering, they’re Brotherhood, Dedication, Self-Respect, Attitude (helpful), Confidence, Discipline, Cooperation, and Respect — they’re also presented in the weirdest possible way. Alpha refers to them as puzzle pieces, and says we’ll be hearing about each one over the course of the video, and it starts off with a simple pattern of seeing a few warm-up exercises and then hearing about one of the principles. Eventually, though, when they start realizing that they’re running out of space, they start happening more often, and then finally we just get the last three dumped on us at once. It’s like they had no idea what was going to be in this video before they started editing it, and only had the one chance to get it all done. In the end, though, it more or less comes together, but alas. 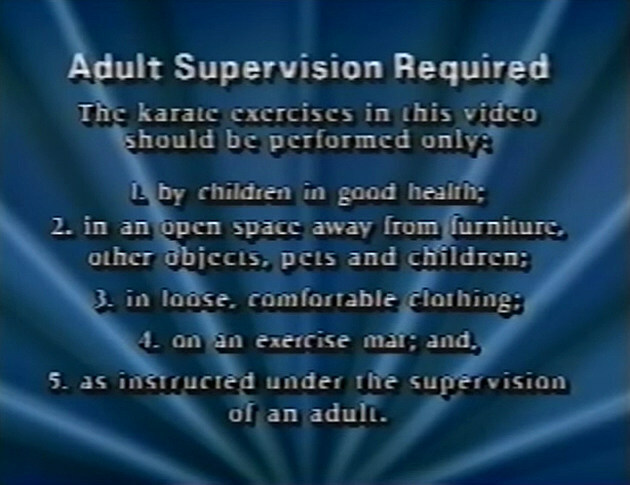 Without Level 2, I’m afraid that our introduction to the exciting art of karate will have to end here. Unless, of course, we move on to the non-canon Karate Masters: Martial Arts For Kids, starring Austin St. John. If nothing else, I want to see how the Red Ranger handles the challenge of walking across a room with a coffee cup.